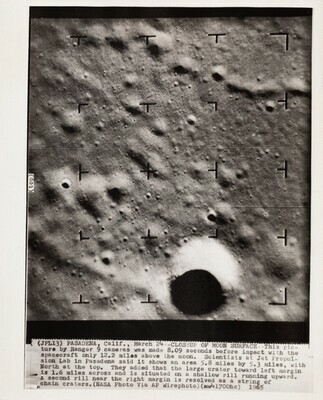 across bottom printed in negative: (JPL13) PASADENA, Calif., March 24-- CLOSEUP OF MOON SURFACE-- This pic- / ture by Ranger 9 cameras was made 8.09 seconds before impact with the / spacecraft only 12.2 miles above the moon. Scientists at Jet Propul- / sion Lab in Pasadena said it shows an area 5.8 miles by 5.3 miles, with / North at the top. They added that the large crater toward left margin / is 1.6 miles across and is situated on a shallow rill [sic] running upward. / A second rill [sic] near the right margin is resolved as a string of / chain craters. (NASA Photo Via AP Wirephoto) (mw41700ho) 1965; on verso, by unknown hand, across top in blue pencil: Moon [circled] Ranger 9 photos; top center stamped in blue ink perpendicular: RRV 16641; center stamped in red ink perpendicular: This picture is the property of The Associated / Press and may be used only for the purpose of / reproduction when authorized by the owner. It may / be syndicated, rented or loaned, or used for / advertising purposes of for the purpose of trade / The following credit must be printed under / each reproduction of this picture: / ASSOCIATED PRESS / WIREPHOTO / [illegible] PATENT OFFICE; lower right stamped in green ink: PROPERTY OF / NEWSPAPER DIVISION / MAR 1965 / FIELD ENTERPRISES, INC.